What is better than cash you may ask? Electronic payments of course! Easy question, easy answer, anything else you need to know? Actually, there is a lot more to it than that and that's why the Rural Finance Thematic Group and the Better than Cash Alliance held a seminar at IFAD on 21 August. "Empowering people through electronic payments" . Tidhar Wald, from BTC walked the participants through an interesting presentation on why the alliance is convincing Governments, the development community and the private sector to shift their payments from cash to electronic – paving the way to expand financial inclusion and help people in poverty grow assets. Digitizing payments can create lasting benefits for people, communities and economies such as: cost savings, transparency, security, financial inclusion and access to new markets. Today, more than half the adult population – 2.5 billion – are excluded from the formal financial sector. It seems that there is no question as to the efficiency that this shift would lead to, in fact, a stimulating discussion took place on the pros and cons of this shift and how challenging it will really be to replace a cash economy – 'cash is the way people think' …'a cash element will always remain' …'we have a long way to go to make services available to the local people ' these were just some of the comments made. 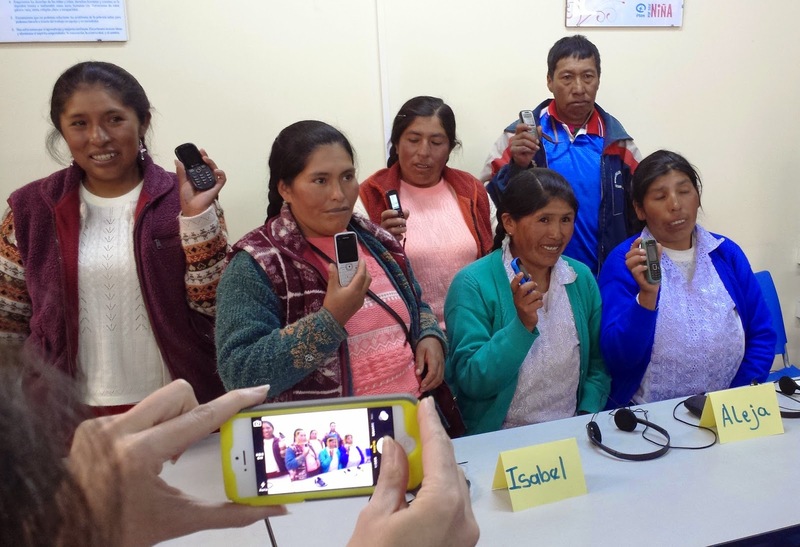 Andean tribal people, Cusco Region, Peru, beneficiaries of a financial graduation programme by the government. Although there are challenges, there are benefits too... Governments can save up to 75% when making payments electronically rather than in cash, on what? Corruption, theft, insurance costs, less middlemen – all these and other factors drastically increase savings as the costs incurred with cash no longer exist. Mainly BTC aims to see donors committing to implement electronic payment solutions instead of cash. Another aim is for improved economic security for millions of low-income and poor people, enabling them to use bank or electronic accounts to build savings and assets via innovative payment technologies. IFAD has been invited to become a member of the Better than Cash Alliance and the process to reach a decision has started. Current partners of the Alliance are: The Bill & Melinda Gates Foundation, MasterCard, Citi, The Ford Foundation, Omidyar Network, The United States Agency for International Development (USAID), and Visa Inc., and the United Nations Capital Development Fund (UNCDF) as the Secretariat of the Alliance. In fact, IFAD is already using electronic payments so what would our actual role be? To showcase IFAD’s leadership in its process to accelerate digitization of payments and jointly promote greater use of secure, sound electronic payments in the world. Did you know? Another reason not to use cash - cash is unhygenic and 94% of all paper bills are contaminated - with drugs and dangerous germs!